These days, there are a million ways to get caught having committed a crime. DNA evidence, CCTV footage, nodding off at the scene and 999,997 other things are all enough to have you sent to the slammer so fast you don’t even have time to wonder who still calls it ‘the slammer’. In days gone by, this wasn’t quite the case. Before modern policing, getting away with a crime was as easy as getting away with taking candy from a baby. An all-points bulletin in 1800 consisted of riding a horse to the next village to inform the local authorities that they’re on the lookout for ‘a big chap. Smelled of teak. Quite rude’. Literally all you had to do to escape suspicion in that case was wash and say ‘please’ when buying food. 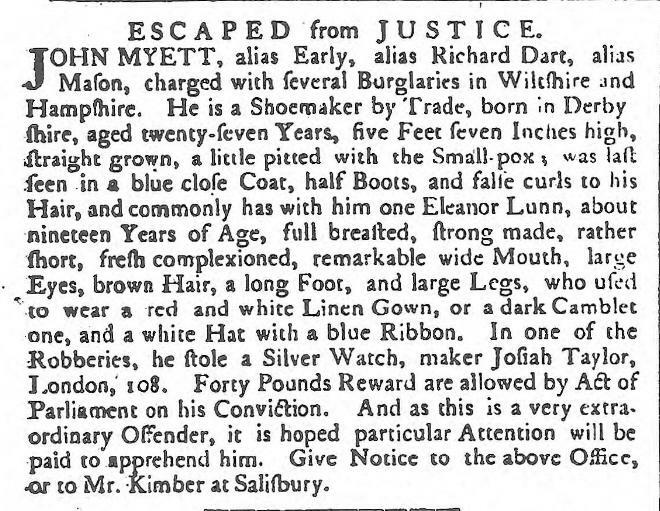 One way of spreading information relatively quickly was by using the newspaper to inform police everywhere of the scoundrels that should be on their radar, or whatever the 18th century equivalent of radar was. Tea leaves, maybe. A voice on the wind. 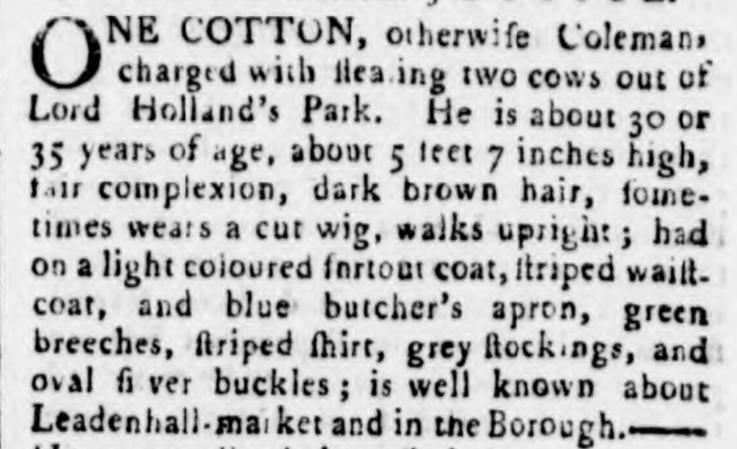 I’ve had a root through the newspapers for the descriptions that were intended to help police apprehend crooks and those on the lamb in days of yore. I’ll start by saying that reading this page is like reading Russell Brand’s description of the individuals in a police line-up. 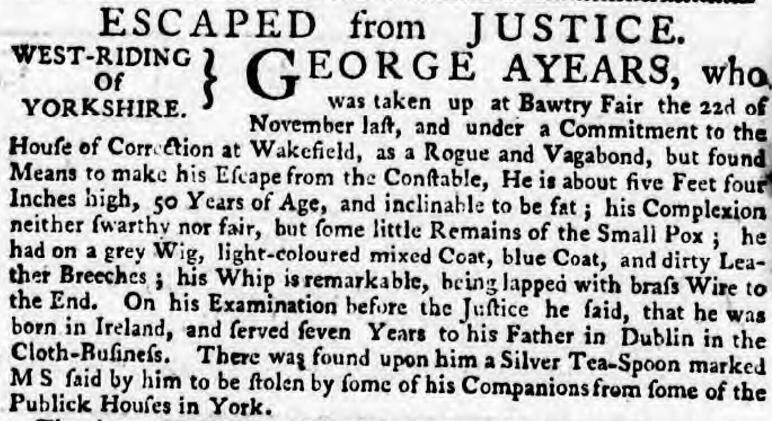 Looks like George Ayears caught a certain constable napping when he made good his escape despite being a rogue and a vagabond AND being ‘inclinable to be fat’. George also survived smallpox, but the disease apparently addled his brain just the right amount to make him think that the way to avoid suspicion and detection was to carry around a whip with brass wire braided into the end. Not cool, George. This more than anything else is evidence of the low standard of policing of the time. If the Metropolitan Police issued a notice in a newspaper in 2015 that read ‘there’s a lot of wrong’uns about. If someone looks like a wrong’un, nick them and we’ll work out if you guessed correctly’ there would be a right hoo-ha. Luckily they added that he walks upright so the police didn’t go out and collar Crawly Pete, the All Fours Fiend. I’m not sure if this was the intention of the Police Gazette, but if I were to apprehend Robert Armstrong, I’d just want to go for a pint with him. Me and Bobby, laughing it up while he leads the coppers on a merry dance. For more examples of the notices that were once meant to help catch criminals, explore our newspapers today.